In response to requests from leading AV rental dealers, the StageScreen is a totally new concept in projection screen design. It is designed specifically to be flown, but can also be used with legs. Either way, it is the strongest and most rigid screen on the market. The truss system is completely modular. All available sizes of StageScreen are built from combinations of the same 6 standard color-coded frame sections pictured below. Not only does this make screen assembly faster and easier, but if a frame section should ever become damaged you can replace it in seconds without tools. 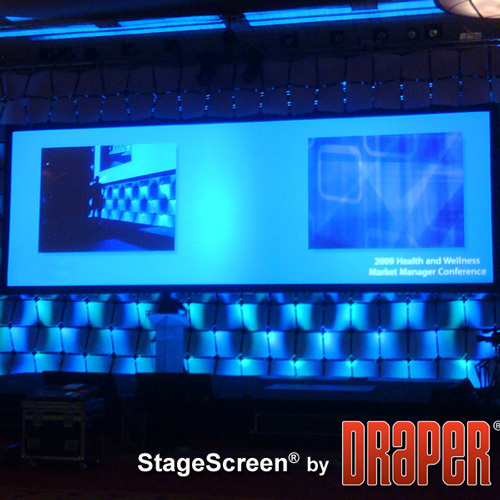 AV rental dealers can easily streamline their inventory with the StageScreen. You can change a Multiformat to an NTSC, HDTV, or 16:10 format at minimal cost by exchanging or removing a few frame sections (separate viewing surface required). The return on investment becomes immediately evident when comparing the cost of several sizes of folding truss screens to the StageScreen. Legs are constructed using the same truss sections as the frame. New! Dress Kit now available! * The StageScreen utilizes an 8” truss that is significantly stronger than traditional truss folding screens. * It is engineered to hold tolerance after repeated usage. * Color coded frame sections ensure fast and easy assembly. * Draper performed in-house testing of the strength of the StageScreen truss compared to a folding truss screen. The results were dramatic: StageScreen proved to be over 60% stronger, holding strong long after the folding truss failed. * The image area of each screen is exact and true to format. * No hinges, no snaps, and no Handy Cranks are required. * Frame sections are connected with permanently attached threaded links and guide pins. No lost handy cranks. * StageScreen features a revolutionary new viewing surface attachment method. Using the attached DuraLoop™ bungee cord loops with handy nylon pull-tabs, simply hook the surface to the posts on the frame. DuraLoops are longer lasting than traditional snaps, and provide even self-centering tension for the viewing surface. You’ll never want to use snaps again. * The viewing surface is stretched perfectly flat, resulting in the highest picture quality. Standard viewing surfaces include: Black-Backed M1300, the perfect Matt White diffusing surface and Cineflex (1.3 gain), a neutral grey for rear projection.